Roller Coaster Dice Guide & Review - Casino Answers! The concept of Rollercoaster Dice is easy. The game will roll a pair of dice and you must predict whether the next roll of the dice will be higher or lower than this roll. The game is played on a ladder. For every consecutive win you receive, you will get closer to a higher payout. When you start playing Rollercoaster Dice, the game will ask for the amount of your wager. Your choices will be $0.10, $0.20, $0.30, $0.40, $0.50, $0.75, $1, $2, $3, $4, $5, $10, $15, $20, $25 and $50. With this array of betting options, Rollercoaster Dice is great for low and high stakes casino gamers. Choose one of these bet amounts and hit “Play” to start Rollercoaster Dice. Once you start, the game will throw the pair of dice. The amount will be displayed on the bottom of the ladder and the game will ask you if the next throw will be higher or lower. Predict correctly and the game will continue. The game will end if you predict incorrectly and you will lose your bet. For each correct prediction, you will move up the ladder. Eventually, you will reach a payout level. The game will ask if you want to accept the payout or continue playing to win up to 30X your bet. It is possible to roll the same number twice in a row. The game will add “or same” to the Lower option when the roll is between 1-6 and it will add “or same” to Higher when the roll is between 8-12. Two 7’s in a row always wins. The payouts on Rollercoaster Dice are as follows: 4X on your 5th consecutive win, 7X on your 7th consecutive win, 13X on your 9th consecutive win and 30X on your 11th consecutive win. Your game progress will be shown at the right of the screen. To get a 100% up to $125 first deposit bonus and a 250% up to $125 second deposit bonus – a $250 welcome bonus – please visit Windows Casino! Are any of the online casinos that offer Rollercoaster Dice US-friendly? Unfortunately, none of the Playtech casinos are accepting registrations from players located in the United States of America. However, you can play some specialty dice games like Poker Dice and Dazzling Dice at US-friendly Vegas Tech casinos such as Silver Dollar Casino. Do I need to download any software to play Rollercoaster Dice? 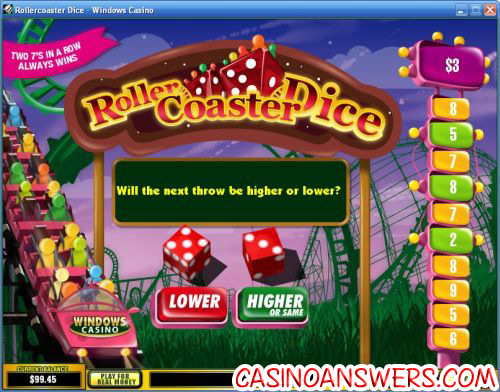 Windows Casino offers Rollercoaster Dice on their instant play casino as well as their regular downloadable casino software. If you have any problems playing the Rollercoaster Dice Flash game in your browser, make sure you have the latest version of Adobe Flash Player installed on your computer. How much can I win playing Rollercoaster Dice? If you are a serious high roller and wish to bet the maximum bet of $50 on a game of Rollercoaster Dice, you can win up to $1500 on a perfect game. No matter what your bet is, the maximum prize is thirty times your bet amount. Can I play Rollercoaster Dice for free in practice play? If you don’t wish to play for real money and wish to play Rollercoaster Dice for fun instead, Windows Casino, Cameo Casino and every other Playtech casino will allow you to play Rollercoaster Dice for free.